Current categories dinar trading reality confusing and cumbersome for economic, commercial and service activities, at the Iraqi market, the reality of the dinar to assess commercial exchanges, a single clause, is far from accurate, as well as in the assessment of real estate sale and purchase, lease, banking facilities, and any circulation coin, assess any deal large amounts between parties need to populate categories of bags of dinar exchanged between buyer and seller. And you can see the sights are people carrying sacks of dinar fell to banks or money exchange shops or out of them. Certainly, the reality of the Iraqi dinar and the low value purchasing groups catalyst for counterfeiting offences, States that equal their exchange rate with the Iraqi currency is plagued by counterfeiting, counterfeit currency with devastating effects on macroeconomic components of any State. And the Iraqi dinar is now rolling its zeros, you diminutive purely value important role in rising prices of goods and services and mounting inflation rates, deals in wholesale of small value groups are excluded from the dinar, add a few thousand dinars for consumer goods deal or perennial, and circulation of another marketing outlet and into the hands of the consumer, the price of the commodity is thumping consecutive number of outlets marketed. The reason is the low purchasing power of the dinar which exclude small groups when assessing the price of any commodity. On 27 August 2015 published (economic studies unit, Centre for strategic studies and research links) on its website an article however guarantee refer to the «that the Iraqi Government might resort to edit any dinar (floated) and is not going to solve the problem in the country's finances, but would have catastrophic effects on the Iraqi citizens. On the other hand, the float is an outlet for market speculators to do money laundering and manipulation of currency auctions within the Central Bank. Floating the currency means leaving the exchange rate floating currency rises and drops in inverse with market demand and supply condition. And taking into account the level of free national economy, quality performance, and flexibility of the productive apparatus. And risks of this process is that it opens the door to money laundering and corrupt money from Iraqi dinar to free exchange for smuggling abroad. The survival of the purchasing power of the Iraqi dinar seesaw weak at home and abroad are not supported with financial corruption contributes to convert other currencies dinar run out what causes inflation, as keep large amounts of Iraqi dinar into the market liquidity, inflation means the inspissated more foreign currency from the country. The solution is not to delete the zeros dinar or floated, but bring new Iraqi dinar exchange rate link to the US dollar. No new Iraqi dinar is equivalent to a dollar exchange rate. One dinar is composed of 100 Fils and groups: one dinar, five dinars and 10 dinars, 20, and 50 dinars and 100 dinars. And minted coins from Fils, five FLOSS, FLOSS, and twenty ten a penny, 50 Fils, and 100 Fils. And ensure the stability of the monetary system and eliminate the imbalance in the current system that allowed widespread corruption. As its previous order was cancelled after 2003 and replaced the dinar currently rolling, the current can be cancelled during the period and bring new dinars. It is important to draw the Central Bank experts from «the Federal Reserve «(Central Bank) in developing Iraqi monetary system done enjoying the confidence of the high Exchange locally and internationally. Central banks play a major role in controlling the financial instruments in all countries of the world, the most important tool in the hands of the Central Bank's monetary policy, by increasing liquidity can stimulate the economy out of a situation of economic crisis, to help the economy grow by encouraging exports, and reducing inflation. Either the Iraqi dinar currency link to the U.S. dollar, it means installing the dinar currency rate fixed exchange rate and much of the world adopt this practice, there are 17 countries in the world have linked its currency to the US dollar, including six Arab countries, namely Saudi Arabia and Jordan and the Sultanate of Oman, Bahrain and the United Arab Emirates and Qatar. Linking the Iraqi dinar to the dollar has several advantages, notably exchange rate policy management easily between his State and the rest of the currencies of the world, identifying a specific rate, the monetary authorities of dollar-dinar exchange through which the dinar relationship is determined by other currencies, rising for those currencies with higher dollar and decreases with decreasing. On the other hand, the link with the dollar relatively helps to protect the national economy from inflation as well as help link in case the oil States on the stability of local currency earnings when the depreciation of the dollar, oil price stability imposed the global devaluation does not lead to lower Iraq's oil revenues to the dinar. New version of Iraqi dinars would be a way to detect corruption requiring replacement currency currently in the new currency. And in that expose to have billions of Iraqi dinars and act under the current monetary system is weak and politicized furthest about transparency. It could be the Central Bank and commercial banks before the deal could expose any abuses to money laundering and smuggling hard currency abroad. 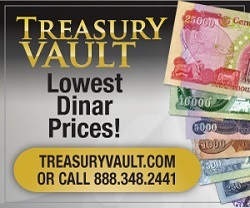 The main reason behind linking the dinar to the dollar is to maintain stability and increase the confidence of dealing, as maintaining a fixed exchange rate for the dinar is called parallel malady market (black market). And that boosts investor confidence in the monetary system and stability and maintain consumer purchasing power of low income. Thanks Ikea but link won't work do you have another link? Apologies, I corrected the URL. ikea wrote: Apologies, I corrected the URL. "New BD version .. enhance cash to our system"